Summer is here and so is the time for our feet to be free of boots and warm, wooly socks and be put into strappy sandals and espadrilles instead. Whether you go for the flats or heels, it's an open playing field, just don't forget to make sure your feet are meticulously groomed as it's always an essential part to complete the look. Here are some suggestions for the incoming of warmer weather, so you can greet the new season with style! Sneakers have always been a player in the shoe game, however, this year they're coming back stronger than ever. 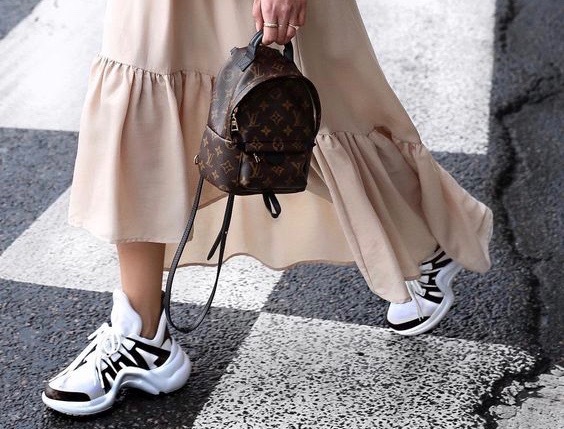 Brands like Balenciaga and Louis Vuitton featured big chunky sneakers in their latest collections that can give any outfit a chic, sporty mood. Depending on your state of mind, you can style these up with wide-legged trousers or dress them down with your favorite denim. The next player up is the kitten heel. Yes, those cute little heels that give a little bit of oomph and can doll up any outfit. Since the 1950s, the kitten heel has carried a sense of innocence in comparison to its big sister, the stiletto. These dainty heels are quite comfortable and can go with casual as well as more dressy ensembles. Pair them with your preferred flowy dress or with a nice spring pantsuit. The possibilities are endless for styling this versatile little kitten! Last on the list are the strappies - those shoes that entwine your feet and ankles like beautiful vines. These can be any style of shoe from flats, heels or even espadrilles. Strappy shoes can match wonderfully with any outfit from the classic white tee and high waisted jeans to an edgy leather skirt. Having straps adds little accents to your feet and can pull a more versatile feel to your outfit. These are just a few simple styles from the many choices of shoes for this years spring/summer season. After all, as a wise person once said, "Life is too short to be wearing boring shoes."